First, rubber cleats replaced metal spikes. Now rubber cleats are being replaced by...nothing. Well, that's not technically true; if there really was nothing on the soles of our shoes, most of us would finish every swing on our backsides. Thanks to trendsetters Ryan Moore and his TRUE Linkswear Tour, Fred Couples and his Ecco Street Premiere, and Ernie Els and his Callaway Del Mar, over the last year or two a whole new breed of golf shoe has emerged with neither spikes nor cleats to keep us upright but rubber ridges, grips, nodules, treads, studs, and nubs in an assortment of patterns, shapes and colors. The primary objective is to bring the golfer ever closer to the ground; enhancing stability, improving comfort and, in some cases, giving you a sense of playing barefoot. And there are the added advantages of being able to drive to the course, play 18 holes, have a drink in the bar, go home and mow the lawn, then go out to dinner/movie in the same pair of shoes (you might not want to go to a meeting or attend a job interview in them but, from Saturday morning to Sunday evening, you could happily wear a pair of these for just about anything); and further reducing damage to your course's playing surfaces, the greens in particular. The main attraction though has to be comfort. Virtually every time I tried a new pair on, I'd remark that these were the most comfortable shoes I'd ever worn. And contrary to the mistaken belief they must be for old duffers out for a quiet game on a Sunday afternoon or that manufacturers focus on comfort and styling at the expense of traction and performance, I never once wished I'd been wearing more traditional shoes for a particular shot. The biggest challenge for spikeless models will no doubt come in winter when the ground becomes wet, muddy, and often frosty. How will they hold up? Will they let in water and/or prevent you from slipping? Most of the shoes listed come with some level of water-resistance, a few even offering one or two-year waterproof warranties. But when the weather turns grim, I might be happier in an 'old' pair of Dryjoys on Bellingham's hillier courses - Shuksan and Sudden Valley - especially if there'd been some rain. At Lake Padden, North Bellingham, and the country club, however, I suspect the spikeless shoe will still perform admirably. If you 'winter' in Arizona and never play in the rain, then one of the pairs below is probably all the golf shoe you're ever going to need. - Super soft premium leather. - Duramax rubber outsole - a proprietary rubber compound that provides turf gripping and performance and durability. Definitely one of the pairs that elicited a 'most comfortable shoes I've ever worn' remark. Love the waterproof warranty too, and a good range of colors and styles to choose from. FJ size 11 feels a little larger than other brands' size 11. 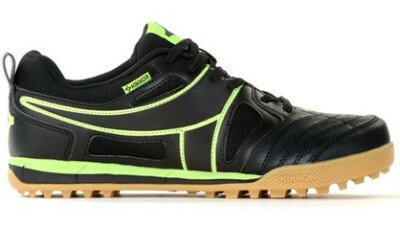 - Kikkor KOOSH midsole with suuport shank for comfort and stability. - Kikkor VEKTRboard outsole traction sustem for ultimate grip. - Kikkor Komfort Foam Technology in tongue and collar. Bellinghamgolfer loves the whole Kikkor spirit - young entrepreneur (and former NCAA champion now appearing on Big Break Greenbrier) gets tired of old-fashioned golf shoes so designs great value shoes he wants to wear...on the course, on a skateboard, on the town, etc. They're just cool. - Ergo Traction 2.0 outsole. - 3D mesh-liner and insole. - Water-resistant leather upper. The most comfortable shoes of the lot. Don't feel barefoot exactly, but do seem closer to the ground in these than with any other pair. That undoubtedly gives a sense of stability. Not the best-looking shoe tested perhaps, but a joy to walk in. 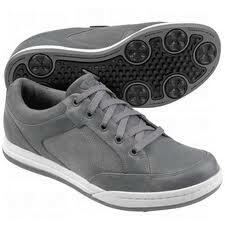 - Outsole provides more than 800 traction angles for excellent grip. 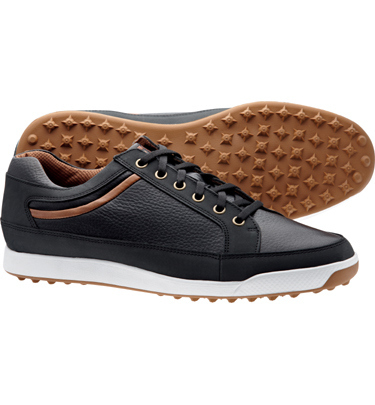 - Removable second skin leather-covered insole with Ecco comfort-fiber system. - Single density TPU outsole with more than 150 molded traction bars. Fred Couples put this shoe on the map (can shoes be put on a map? ), introducing them to the world at the 2010 Masters. One of the grippier pairs tested; I'd feel pretty confident going out on a wet day in these. Fancy uppers which you either love or hate, and pretty expensive too. - Soft, full-grain leather upper. - Rainsport and Drysport waterproof technologies provide ultimate in comfort and dryness. - Comfort Tech Gel Tongue. - One year waterproof warranty. No, hang on, maybe this was the most comfortable pair. The Del Mar is probably the shoe I've worn most often over the last two or three months. It reminds me of the Vans I used to wear as a skateboarding teen way back when. These are solid, sturdy, handsome shoes. And did I mention how comfortable they are? - Weighs just 260g - the world's lightest performamce golf shoe. - Nanospike Technology replaces traditional spikes with superior traction and greater flexibility. As you'd expect from Oakley, the Cipher just looks cool and, as the marketing material states, it is incredibly light. It grips well too. In fact there's nothing wrong with this shoe that a slightly smaller price tag couldn't put right. - Cross-over appeal of a town shoe. - Tumbled leathers and rich suede accents. - Two-year waterproof warranty. Takes all the best bits of all the others and puts them in one shoe. Good-looking, light, grippy, and waterproof. There's an extensive range of color options too. 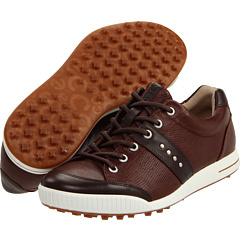 It's a little pricey perhaps, but still $60 less than the Ecco Street Luxe. - Cushioned footbed and midsole for advanced shock absorbtion and support. - Rubber outsole with S2Quill spikes for serious grip. 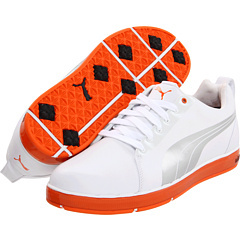 Whereas the Ashworth, Ecco, Footjoy, and Callaway shoes might be attractive to all age groups, the Puma is probably reserved for the younger, hipper set. The Luxe was modeled on the popular Puma Clyde Basketball sneaker, so you know it has sound DNA. Three color combinations of the lace-up model; two color combinations of the velcro-strap model (shown). 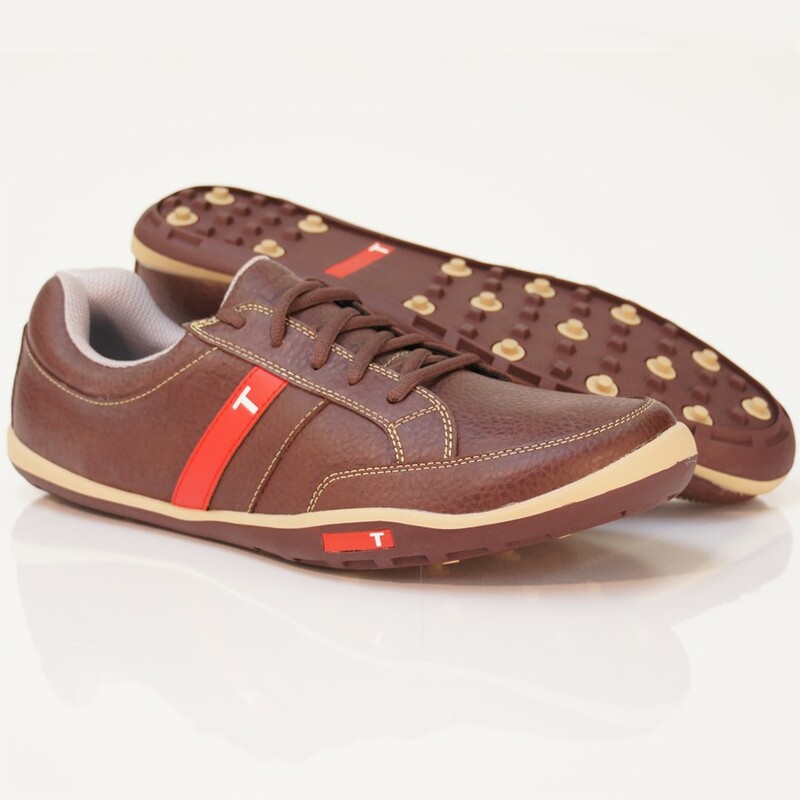 - Full grain leather upper provides rich look and feel. 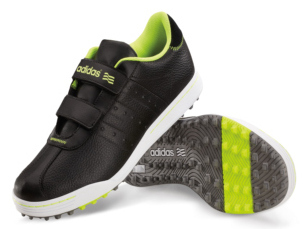 - Spikeless outsole provides necessary traction, comfort, and off-course versatility. - Offered in Medium and Wide widths. - Velcro Strap model priced at $80. The great value adicross will continue to be sold until the end of the year. The adicross II will be available from November 1st. I've not seen it yet, but I like the idea of the velcro strap. And if it's anything like as comfortable as its predecessor, then it will likely be every bit as popular (over 200,000 pairs of the original adicross have been sold). 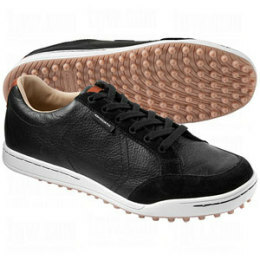 - Water-resistant synthetic leather and textile upper provides soft, lightweight, durable performance. - THINtech low profile technology for improved traction and stability. 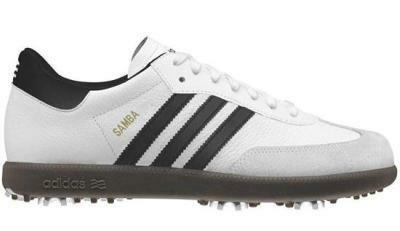 Okay, the Samba isn't strictly 'spikeless' because it does possess six cleats on the sole. But I've worn Samba trainers for 30 years - as a kid, teenager, young man, and less young man, so I wanted to find space for them. I love these shoes, and always have. In fact, I'll probably go to my grave in a pair of Sambas.